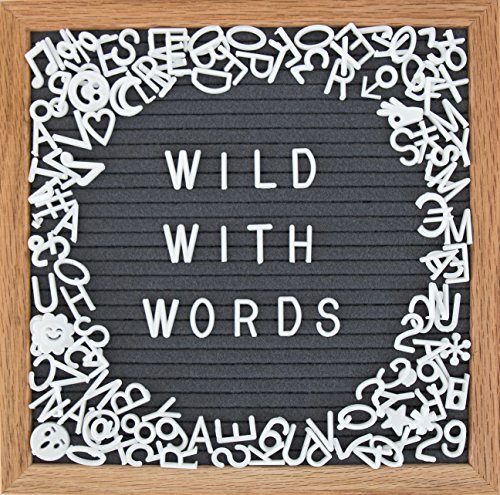 Wild With Words have you covered with our high quality felt letterboards that are crafted with love & packaged to perfection. Whether you're a decorating extraordinaire, craft enthusiast or just wild for words, we know you want and deserve the best! VERY HIGH QUALITY - Our felt letterboard set is the best changeable letterboard set today! It's crafted with the highest quality materials, reinforced wooden oak frame, soft gray wool felt, sturdy picture frame stand & metal mounted hanger hook, all complete with beautiful custom packaging. ALL THE ACCESSORIES YOU NEED - All our 362 letters, characters, symbols, numbers & emojis are designed to fit perfectly and secure on your board so you never have to worry about loose letters that fall out. We also include a cute cotton storage bag to keep them all safe. GIFT READY - Our boards are packaged to perfection. We believe our Wild With Words letterboards are such a beautiful gift that we've taken out the fuss of needing it to be repackaged. With custom packaging our letterboards make the perfect present! WILD WITH WORDS - Our letterboards are the best decorating piece to personalize your life wherever you are in the world. Take it to a special event, create positive or romantic messages, to do lists, quotes that make you laugh, the possibilities are endless. ADD TO CART NOW - We are confident you will love our boards just as much as we do & your satisfaction is our #1 priority! 100% SATISFACTION GUARANTEE - Our felt letterboards are backed by our manufacturer 30 day money back guarantee and 1 year free replacement warranty. If you have any questions about this product by Wild With Words, contact us by completing and submitting the form below. If you are looking for a specif part number, please include it with your message.